into 62.4 psf of load. The roof members may have been designed to resist excessive deflection and stress at a 20 psf total live load. This additional load of 3 times more than what the roof members were designed to hold can lead to runaway deflection (deflection causing more ponding depth and rain load) and catastrophic failure. double the intensity (For Galveston, i = 4.6 inches/hour for 1-hour duration, and i = 8.0 inches/hour for 15-min duration). Anyone familiar with the heavy, short duration storms that frequently occur along the gulf coast in South East Texas can understand why it makes sense to use this higher rainfall rate that can occur within a shorter amount of time. The next step is to take the tributary area of the overflow drain being analyzed and multiply it by this rainfall intensity with the appropriate empirical factor in Equation C8.3-1, Q = 0.0104Ai. With the flow rate needed to drain this area, the tables in this C8.3 chapter are then used to calculate the hydraulic head for any type of overflow scuppers or drains. be combined with other loads to properly design the structural members. drains placed to prevent ponding. 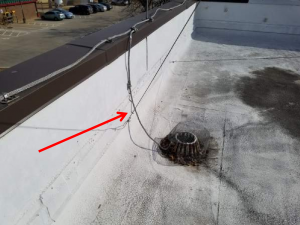 Providing a systematic study of existing buildings is a great idea to rapidly assess multiple flat roofs and provide an assessment of ponding instability. Since it is a life safety issue as well as a huge cost when a roof collapses due to ponding instability, this method could be employed on a state-wide level in America beginning with public buildings as well. in-depth Excel file which can be used to double check calculations for the roof joists as well. 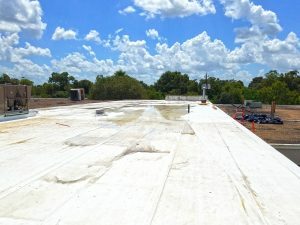 Our hats are off to Dr. Patterson, Dr. Mehta and others who understand and educate others on the vital importance of proper design in regard to roof drainage. 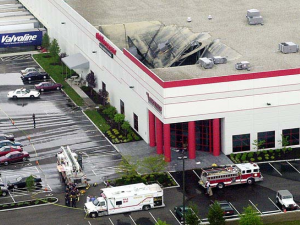 Though catastrophic roof failures are rare, the associated consequences on your building or a building you may occupy should force this topic to the forefront of any acceptable building design.